You can pay by credit or debit card using Mastercard, Visa, Visa Debit (previously known as Visa Delta) and Visa Electron cards. If you are a company making a bulk order and wish to be sent an invoice for a payment to be made by BACS, wire transfer or cheque, please contact us on 01344 773096 or via the contact form. Online payments are taken through SagePay or Paypal, but you can use either payment gateway without opening an account. SagePay is the fastest growing independent payment service provider and is a division of business software company Sage, one of the UK’s most trusted business brands. SagePay process over 4 billion secure payments each year for over 30,000 UK businesses of all sizes. By using Sage Pay, The Wind Chime Shop is ensuring that your card details are not compromised. 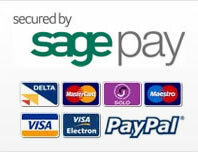 At Sage Pay every transaction is encrypted to the highest global standards. Their secure systems are scanned and audited regularly by one of the world’s leading Qualified Security Assessors (QSA) so that you can be confident about using them to make a secure payment online. Read SagePay's Top Tips for safe online shopping here. We will ask for an online payment to be made at the time you place your order. You may choose either SagePay or the Paypal payment gateway to make your payment and to enter your address and card details to complete your purchase. All of your card details are securely handled by whichever gateway you have chosen. Your payment is forwarded to our bank account and your delivery address and order details are passed onto us. We will not pass on your contact information to any third parties.